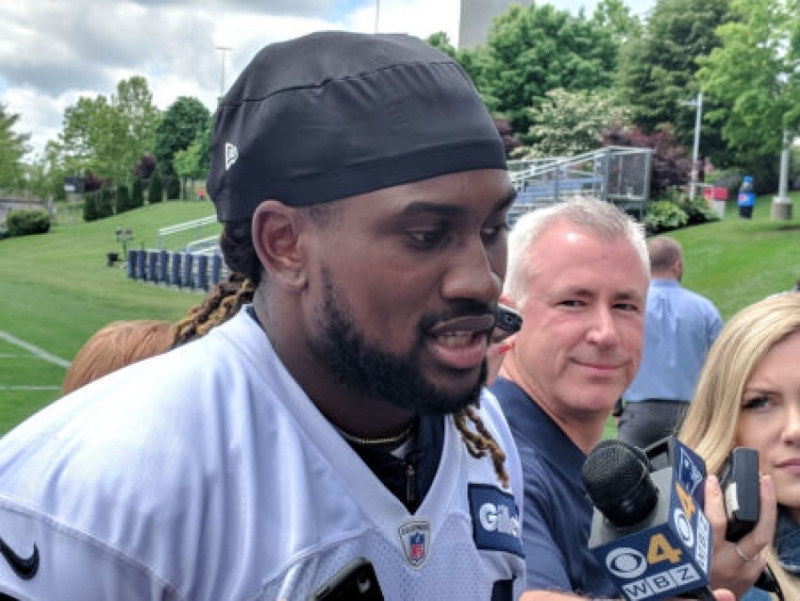 With the news coming down Wednesday that the New England Patriots released wide receiver Kenny Britt, it created yet another opening on an already thin depth chart at the position. 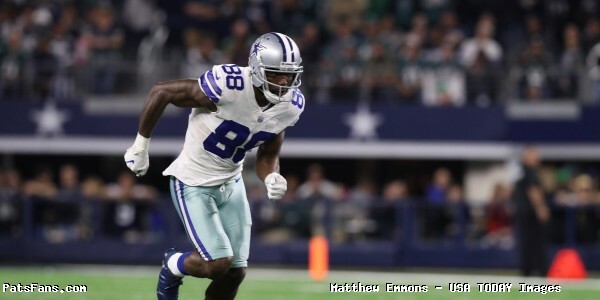 The Patriots, who previously cut Malcolm Mitchell and Jordan Matthews due to injuries in camp, opened the door for additional fan and media speculation that the team should give free agent Dez Bryant a chance. 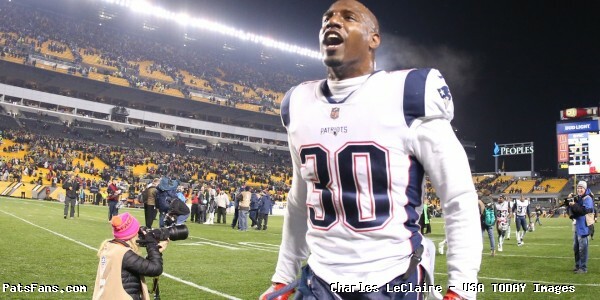 Bryant, who was last seen on HBO’s Hard Knocks leaving the Cleveland Browns without a contract, added more fire to the Patriots rumors when he was spotted calling Tom Brady his “favorite player” in response to an Instagram comment from a fan asking him to come to New England. Could the comment be interpreted as Bryant seeking attention from the Patriots? Surely he knows Bill Belichick doesn’t have a SnapFace or Pandarama account? In the meantime, brace yourself for the Logan Airport “sightings” over the next few weeks. 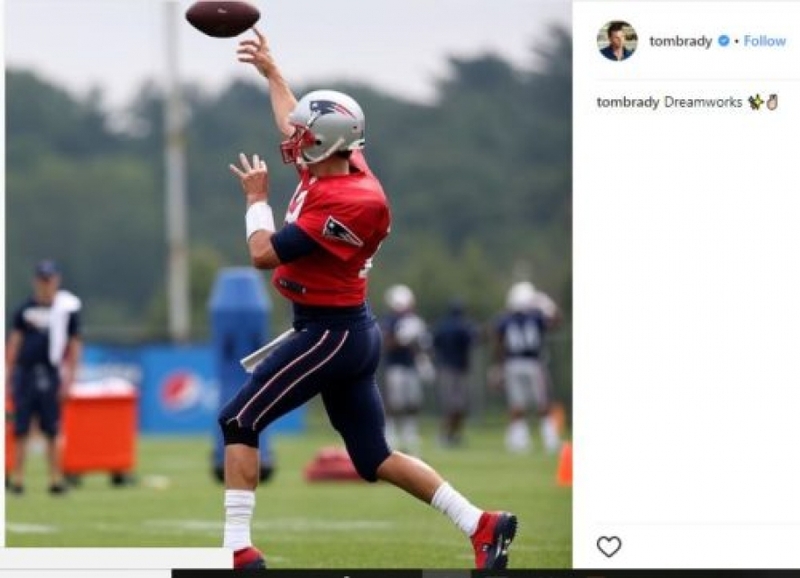 This entry was posted in 2018 Patriots Offseason and tagged Dez Bryant, Jordan Matthews, Kenny Britt, Malcolm Mitchell on August 22, 2018 by Robert Alvarez. The Patriots head into training camp in just a month and the 90-man roster as it now stands is pretty stocked. Which means there will be a lot of players fighting for a very few spots on the 53-man roster. Nowhere is that truer than at wide receiver. 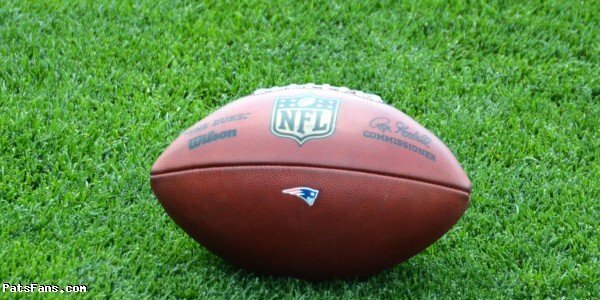 The Patriots (as of today 6/25) have 11 players vying for probably six roster spots. The team usually keeps around six WRs. That number could fluctuate if they feel they can’t part with a player or two. Julian Edelman’s looming suspension may play a factor into that as well. If his suspension stands, then the team will have a full month of the regular season to carry an extra wide receiver and give them a longer look at some players. And of course, health will play a major role in the players that they keep, let go, place on PUP/IR. The Patriots lost their two most productive wide receivers in Brandin Cooks and Danny Amendola from 2017. Both left via free agency. Cooks the speedster that came over from New Orleans had a solid season with 65 catches for 1082 yards and 7 TDs. Amendola had 61 catches for 659 yards and 2 TDs. But in the playoffs, Amendola ratcheted up his game in a big way, hauling in 26 catches for 348 yards and 2 more TDs. Replacing their production will be a big priority. But getting both Julian Edelman and Malcolm Mitchell back from IR, neither played in 2017 will be a huge boost. The team also drafted Braxton Berrios from Miami and has Kenny Britt and Phillip Dorsett back after each got to spend an entire offseason in New England. 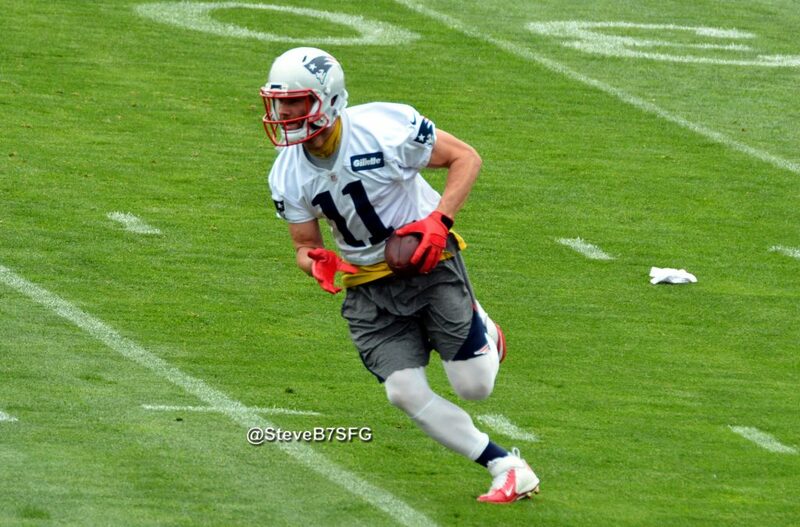 The Patriots get back a healthy Julian Edelman as well as a healthy Hogan this summer. Edelman missed the entire season with a torn ACL and Hogan was dinged up with a couple of injuries where he wasn’t a 100 percent for much of last season. 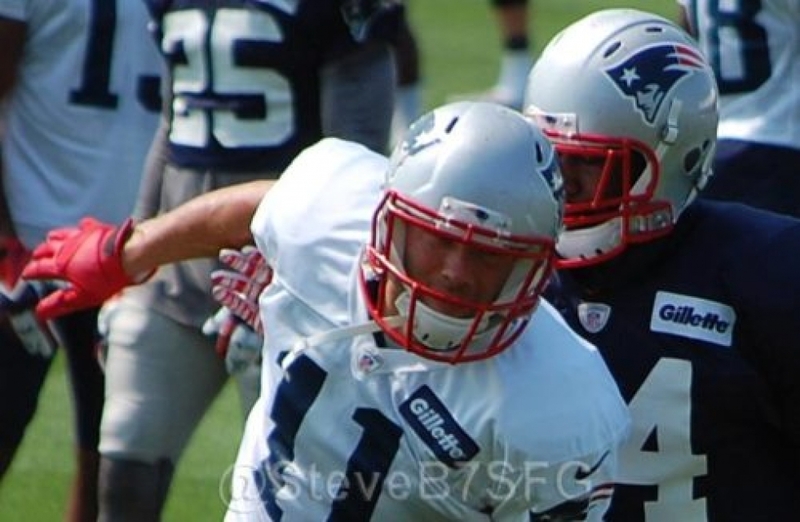 Edelman looked like the Julian Edelman we’ve always seen during the spring. We watched him closely during minicamp to see if there was any difference in his cutting to the left or right and his knee looks 100 percent. The real test will be once camp begins and the hitting starts. The only question with him is if he will miss the first four games with a suspension due to PEDs where he was popped on a random drug test. If his suspension holds, it may end up being a better thing for him, giving him an extra month to fully recover from his surgery and rehab. But it will definitely hurt the team. Hogan is an intriguing case as if the suspension does hold, will the team use him more in the slot or will they turn to a guy like Berrios or Jordan Matthews? It does give the team options. 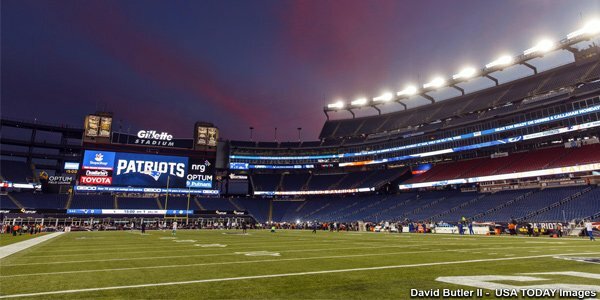 Slater is a perennial Pro-Bowler and in speaking with NBC Sports Boston’s Phil Perry in a podcast today, he again mentioned the changes in the kickoff rules this season and believes Slater and other STs mavens to be even more valuable this season than in years before. Patterson is (at least here) a near lock on our roster due to the changes to the rules governing kickoffs which will make him much more valuable this season. If Josh McDaniels and the coaches can figure out a way to get him involved in the offense, it will be a huge plus. Mitchell had a really solid rookie season in 2016 and followed that up with a big Super Bowl in the win over the Falcons. But unfortunately, that was the last time he’s played in a meaningful game. His knee issues are chronic and he missed nearly all of the spring. The only thing that can hold him back is health. Will he be good to go or will he end up on PUP or IR? Matthews is a very intriguing signing. He was very productive in Philadelphia, averaging over 70 catches a year for three seasons. Last year he had a myriad of injuries and played on a non-passing team that derailed his season in Buffalo. I believe he’s going to be a big part of this offense in 2018. But he’ll have to prove it once the pads come on. Ditto for Kenny Britt and Phillip Dorsett. Both came over last season, Dorsett just before the season opener and Britt later in the season. Dorsett, despite having blistering speed, never really caught on last year. Britt was having a very nice spring before tweaking a hamstring in minicamp and was held out as a precaution the last two days. Berrios was a late round (6th round, 210th Overall) draft pick in the 2018 NFL Draft from Miami. He has the quickness and long speed to be a dynamic slot receiver. But he had a lingering medical issue that precluded him from taking part in any team drills in minicamp. He has some catching up to do. McCarron spent all of 2017 on the Patriots practice squad and now knows the offense very well. With Berrios out during minicamp, he took advantage of some extra work. He looked okay but not great in the passing offense and got second-team snaps in both the punt and kick return games where he did a good job. The Patriots signed undrafted free agent Cody Hollister last spring and he did enough to warrant the team to bring him back onto the practice squad last year. He had a good spring this year as well as last season. But with a top-heavy and loaded wide receiver roster, it is going to be difficult for him to get enough reps to earn a roster spot. He, Berrios and McCarron may be looking at practice squad slots, at least to start the season. And then, depending on what transpires during the season as the inevitable injuries do occur, they may have an opportunity to get some reps in the regular season. 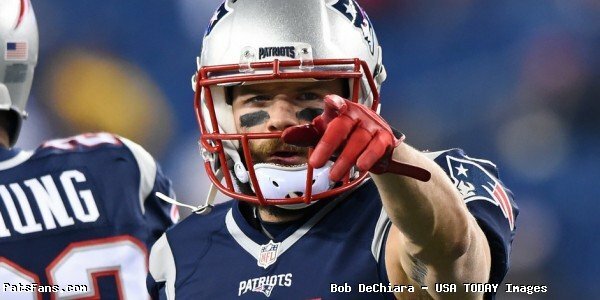 This entry was posted in 2018 Patriots Offseason, NFL Commentary, NFL News, Patriots Commentary, Patriots News and tagged 2018 Patriots Draft, 2018 Patriots offseason, 2018 Patriots preseason, 53 Man Roster Projection, Bill Belichick, Braxton Berrios, Chris Hogan, Danny Amendola, Jordan Matthews, Julian Edelman, Kenny Britt, New England Patriots, NFL, Patriots, Patriots wide receivers, Phillip Dorsett, Riley McCarron, Tom Brady on June 27, 2018 by Steve Balestrieri. 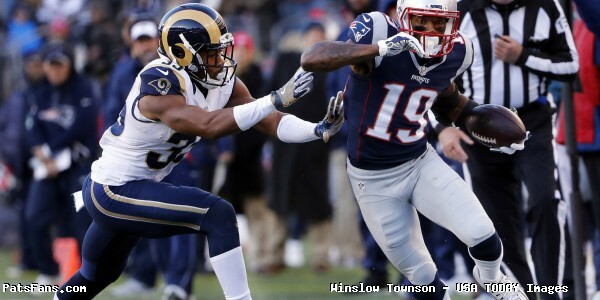 On Friday, the deadline to place New England Patriots wide receiver Malcolm Mitchell on the 53-man roster came and went at 4pm with no move being made. Mitchell will not play against the Tennessee Titans. After a strong rookie season that saw him contribute in the Super Bowl comeback, Mitchell has been dealing with a knee injury that has kept him on injured reserve since September 7th. Mitchell was spotted practicing with the team on Thursday and has been active on social media over the past few weeks indicating his attempts at coming back. According to NESN’s Doug Kyed, should the Patriots advance to the next round, the team will have one more opportunity to activate Mitchell at 4pm on Wednesday, otherwise he will be ineligible for the remainder of the playoffs. 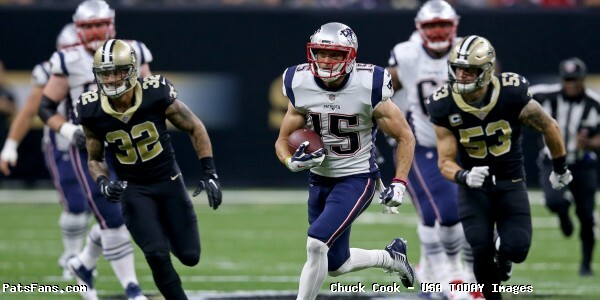 As for the current depth chart at wide receiver, there is some good news as Chris Hogan is expected to return for the first time after missing seven of the teams last eight games with a shoulder injury. Heading into Saturday night, the Patriots will have Brandin Cooks, Chris Hogan, Danny Amendola, Phillip Dorsett and Kenny Britt available for quarterback Tom Brady. This entry was posted in Patriots Injuries, Patriots News, Patriots Twitter and tagged Brandin Cooks, Chris Hogan, Danny Amendola, Kenny Britt, Malcolm Mitchell, Phillip Dorsett, Tom Brady on January 12, 2018 by Robert Alvarez. What Can We Expect From Malcolm Mitchell At This Point of 2017? The Patriots got some good news on Wednesday when wide receiver Malcolm Mitchell returned to practice from IR and the 21-day window has begun ticking. 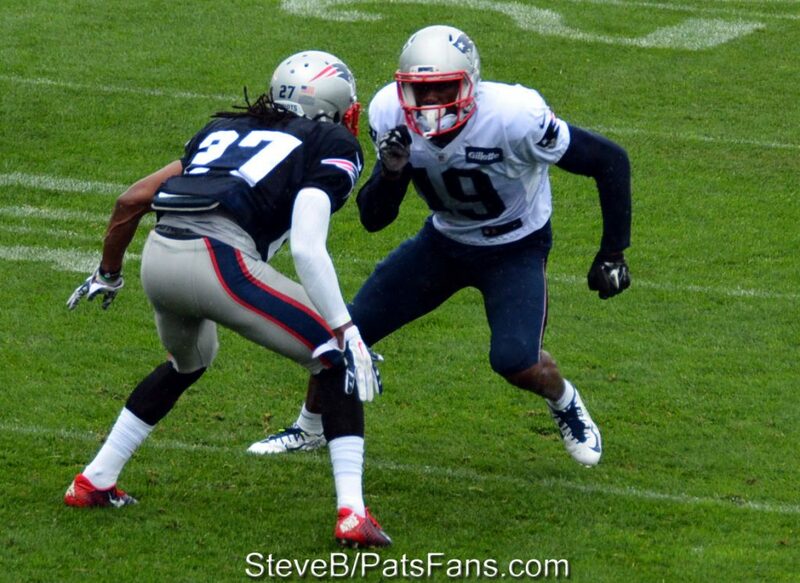 The Patriots have 21 days to either activate Mitchell to the 53-man roster or place him on season-ending IR. Mike Giardi of NBC Boston said that while the Pats will take it day-to-day with Mitchell, he could be activated as early as Sunday in time to face the Jets in the 2017 regular season finale. The bad news is that means Vincent Valentine will not be returning this year. And, once Mitchell is activated, that means another player would have to be released or placed on IR. That means possibly Phillip Dorsett, Kenny Britt or possibly Geneo Grissom could be cut loose. Or someone like Alan Branch, or possibly Rex Burkhead or even Chris Hogan could revert to IR. The Patriots began practicing linebacker Shea McClellin off of IR in mid-season before he suffered a setback and was reverted to season-ending IR. Now, Mitchell is in the same boat. In a perfect world, Mitchell’s return would give Tom Brady and the offense a shot in the arm. In his rookie season, he started slowly due to an injury, but came on down the stretch and had a very effective Super Bowl against the Falcons where he caught six passes for 70 yards, most of it in the second half comeback. Mitchell has decent speed but isn’t a burner. He’s a move the chains kind of guy who can make the tough catches against man coverage. With Hogan on the shelf, that is what the Patriots offense lacks. An outside possession receiver who can move the sticks against tight man coverage. Mitchell, if productive, opens up the large part of the field for Brandin Cooks. It would put a lot more pressure on opposing defenses who want to play that tight coverage where everything is contested underneath. Right now, that guy is Rob Gronkowski, but teams are going to begin to double him. Danny Amendola is effective but works more inside. Dorsett hasn’t caught on to the offense the way the team had hoped. He’s flashed at times but hasn’t been nearly consistent enough. If the Patriots are going to release anyone my thoughts are it would be either Dorsett or Grissom who could easily revert to the practice squad. They signed Britt to a 2-year deal and he’d fit the mold for a bigger possession guy down the road. The Pats already have a speedier, more productive version of Dorsett in Cooks. Mitchell, by way of his strong finish to the Super Bowl run a year ago, was the recipient of high hopes in 2017, but things haven’t worked out. He was injured all through training camp and never took the field once the season began. We won’t know how well his knee holds up until he actually begins playing. And then the question is, what can be considered reasonable expectations for him at this late juncture? He hasn’t taken the field since training camp and even that was in a limited fashion. He really hasn’t taken meaningful snaps since February. That’s why Sunday’s game, if he’s activated, will be so important. That’s the only action he’d get this season before the playoffs start. Which isn’t a lot of time to work off the rust. But it is what it is. Like we mentioned above, in a perfect world, Mitchell would come back in mid-February form and Hogan returns healthy for the playoffs. But unfortunately, that world often doesn’t exist. The potential for the offense with those two healthy and productive is off the charts. Especially if Burkhead returns for the playoffs. So, Sunday’s matchup will have a game within a game if Mitchell is activated. 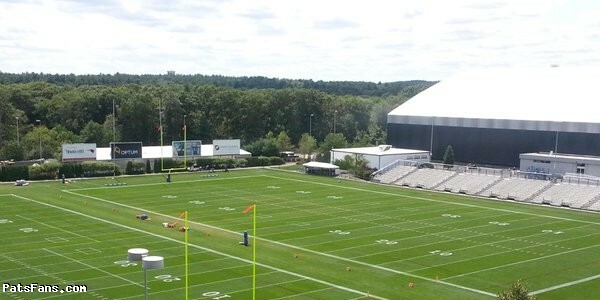 And a lot of eyes will be watching, not all of them from Foxboro. 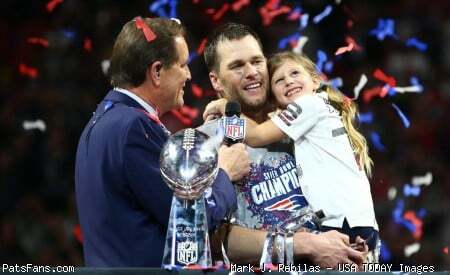 This entry was posted in 2017 NFL Season, 2017 Patriots Season, Patriots Commentary, Patriots Injuries, Patriots News and tagged 2017 Patriots Season, Bill Belichick, Chris Hogan, Danny Amendola, Julian Edelman, Kenny Britt, Malcolm Mitchell, New England Patriots, NFL, Patriots, Patriots wide receiver injuries, Patriots wide receivers, Phillip Dorsett, Rob Gronkowski, Tom Brady on December 28, 2017 by Steve Balestrieri.